Time for Christmas baking! Available for a limited time in selected stores, Alison’s Pantry Fruitcake Mix contains sultanas, mixed peel, real cherries (red and green), currants and raisins. Superb mix for Pineapple Christmas Cake and Easy Mix Christmas Cake. 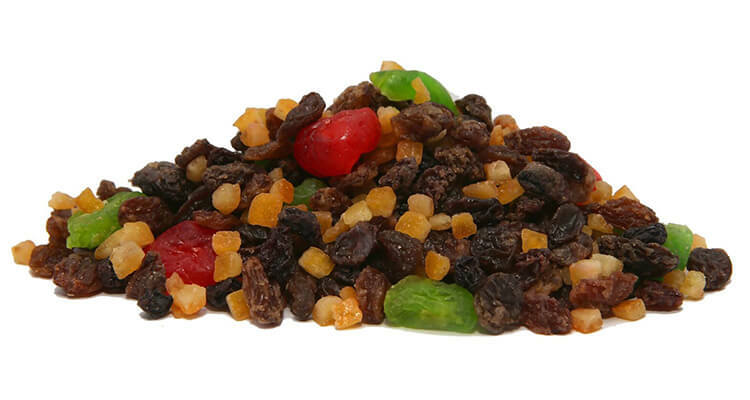 Sultanas (65%), Mixed Peel (15%) (Citrus Peel, Glucose, Sugar, Preservative (202, 220 contains Sulphites), Acid (Citric Acid)), Red and Green Glace Cherries (10%) (Cherries, Sugar, Water, Acid (Citric Acid), Preservative (211), Colours (102, 124, 133)), Currants (5%) (Currants, Vegetable Oil (Sunflower, Cottonseed, Canola)), Raisins (5%).